The Nanofabrication Facility is housed in a class 100/1000 clean room (5,000 sq. ft) dedicated to state-of-the art patterning and processing of thin films, nanomaterials, and devices. The instrumentation in the facility has been optimized to provide maximum flexibility for its users, with capabilities to pattern a variety of materials over a wide range of size scales, from 10 nanometers to 10 millimeters. The clean room is used to fabricate devices for nanoelectronics, nanophotonics, biomedical engineering, photovoltaics, x-ray optics, nanomagnetics and beyond. Thin-film deposition by electron beam and thermal evaporation, DC and RF magnetron sputtering, and plasma-enhanced chemical vapor deposition. An Oxford Instruments Plasmalab 100 uses an inductively coupled plasma (ICP) source for the high-speed, anisotropic plasma etching of silicon, polymers and dielectric materials. The system has demonstrated capability to etch vertical walls in silicon to a depth of 300 µm at etch rates of 3 µm / min with an aspect ratio (width of feature to etch depth) of 50:1. A new system of the same model will be installed by October 2010, which is designed especially for etching metal and compound semiconductor materials. Both ICP etchers have endpoint detection capability. A Trion Phantom III Reactive Ion Etcher is a general purpose fluorine based plasma etch tool for etching thin films generally 1 µm or less in thickness that have been deposited on silicon or other wafers up to 6" in diameter. Many processes for etching thin layers of photoresist, metal, semiconductors, or insulators are available. The Trion Orion III PECVD system is an inductively coupled plasma (ICP) deposition tool used for the deposition of thin films on silicon wafers and other substrates up to 6" in diameter. Current processes in use include the deposition of SiO2, Si3N4, and SiOxNy films. Two individual Kurt J. Lesker PVD 75 vacuum deposition systems are available for thin film sputter and electron beam deposition of a wide variety of materials. The sputter deposition system contains has 3 targets for magnetron sputtering, shutter, rotational holder, and substrate heater. The e-beam system uses a 4-pocket electron beam deposition source with automatic crucible indexing. A small Denton evaporator is available for rapid-turn around deposition of metals. LakeShore Model 8404 Hall Effect Measurement System allows measurement of mobilities down to 0.001 cm2/Vs and resistances from 0.5 mWto 100 GW. Samples can be measured at room temperature and at 77 K.
LakeShore HFTTP4 cryogenic probe station is designed for low-noise, DC to 50 MHz, measurements from 4 K up to 400 K under in-plane magnetic fields up to 1 Tesla. Optical sources can be introduced through a viewport window or a fiber optic probe arm. Signatone CM-170 probe station is perfect for routine electrical characterization at room temperature. It is reliable and simple to use. Rucker and Kolls probe station is suited for studying optoelectronic properties at room temperature. It is fitted with a with a Newport-Oriel solar spectrum simulator and optical monochromator. MMR's Variable Temperature Micro Probe System allows opto-electrical characterization of samples in the temperature range from 70K to 730K under controlled atmosphere (inert, vacuum etc.) and light condition. MBE-Komponenten AO500 high-temperature probe station for rapid thermal annealing (up to 500 °C) in vacuum (2 mbar) or in a gas mixture atmosphere (Ar, H2 and N2 regulated by mass flow controllers). The system also allows optical access to the sample and in-situ electrical characterization. Kulicke & Soffa Model 4526 wire wedge bonder. 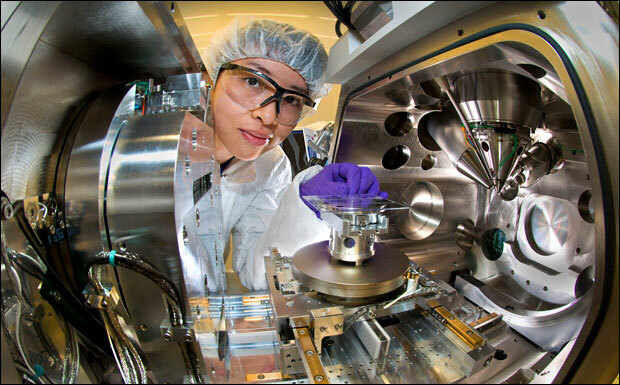 The Nanofabrication Facility features lithography by electron-beam, ultraviolet light, and ion-beam methods providing the capability to pattern from 10's of nanometers up to 100's of microns over large sample areas. JEOL JBX-6300FS, NPGS system Electron beam lithography at 100, 50, 25 keV (JEOL) and 30 keV (Helios w/ NPGS) is available with patterning of feature sizes as small as 8 nm. The JEOL 6300FS provides capability for high-speed, large area exposures (1mm+) and sub-20 nm overlay and stitching accuracy. Karl Suss MA6 Mask Aligner: UV exposure of resist at 365-400nm wavelengths. Substrate sizes range from small chips to 3-inch diameter wafers. Pattern resolution as small as 1um using four-inch square masks. A Helios Nanolab (FEI Company) dual-beam system capable of simultaneous focused ion beam milling and SEM imaging. NPGS nanolithography system can be used to pattern with either electrons or ions. Further capabilities are: gas injector for electron or ion beam assisted deposition of platinum and TEOS (dielectric), x-ray detector for EDS analysis, nano-manipulator probe, high resolution SEM (1 nm), FIB (5 nm), and STEM (0.8 nm) imaging, and in-situ sample electrical characterization.